These eBooks will help you take action. You will be able to stop yelling and build a happier life so you can be the best Mom you can be for your kids. Most parents admit that they yell because of the stress and overwhelm that comes with raising kids. Just trying to stop yelling with sheer willpower won’t get you very far. You need to find the root of your anger and to discover the real reasons why you’ll yelling. 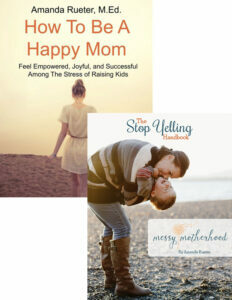 With this book bundle, you’ll get access to two of my most popular books, The Stop Yelling Handbook and How to Be A Happy Mom. These two books can not only help you stop yelling at your kids, but also help you find joy and satisfaction in your parenting journey. Get both today and jumpstart your stop yelling journey.